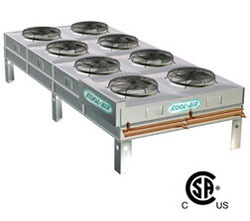 for commercial and industrial process cooling applications, sized to your requirements. Heavy gauge galvanized steel. All cabinets are modular with individual fan chambers. All models have side access panels for easy coil inspection and cleaning. 20 inch dia fan orifices have a 1 inch venturi and 30 inch dia. fan orifices have a 3 ¾ inch spun venturi to provide maximum fan efficiency and minimum noise level. Direct driven fans have aluminum blades, steel hubs and are statically & dynamically balanced for smooth, vibration free operation. Thick wall copper tubes are mechanically expanded in evenly-spaced, full-collared aluminum corrugated plate fins for permanent bond and maximum heat transfer. Fan guards and motor mounts are welded wire construction. Baked on powder epoxy coating provides corrosion protection. Fan motors have automatic reset, internal overload protection and permanently lubricated, sealed ball bearings for long and dependable life. Motors are weather protected for year-round, outdoor condenser duty. Weather resistant electrical box has a hinged access panel and is mounted on the same end as the headers for compact and easy installation. All components, i.e contactors, fuses, fan cycling controls, terminal block, control transformer, are mounted and wired inside the panel with weather resistant harnesses.